Prime Minister Voreqe Bainimarama says while crime nationally is decreasing, crimes in Nasinu and Valelevu are on the rise. He made these comments while opening the new $2.1 million dollars Valelevu police station. He says all the crime cases reported in the country last year, 15% occurred in these areas, of which the most common of are burglaries, robberies, and assault. The new Police Station is expected to provide services to over 130,000 Fijians in the greater Nasinu area. 175 police officers will be based at the new Valelevu Police Station. 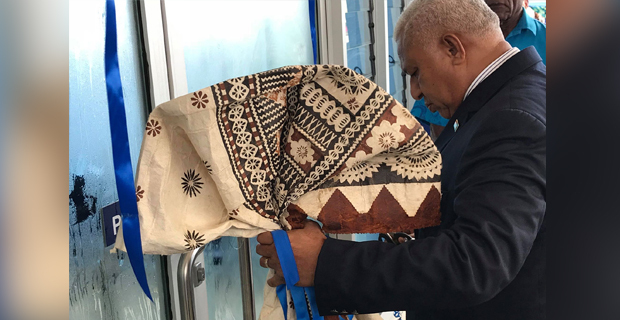 Bainimarama told the officers, they are the shield that guards our people from those grave dangers to their safety and security. He added that they cannot fulfill that duty while sitting behind a desk or behind the wheel of a lorry adding they need to be in the communities they are tasked to protect, they need to know those communities. He told the officers they need to understand how communities operate at the grassroots level, they need to be seen walking the streets, not speeding down in cars and they need to be a face that people recognise and a presence they know they can count on. Listen to the latest news on our 5 radio stations Legend FM, Viti FM, Radio Sargam, FM96 and Navtarang.